This guide explains the basics of common features in Microsoft Excel for PC. 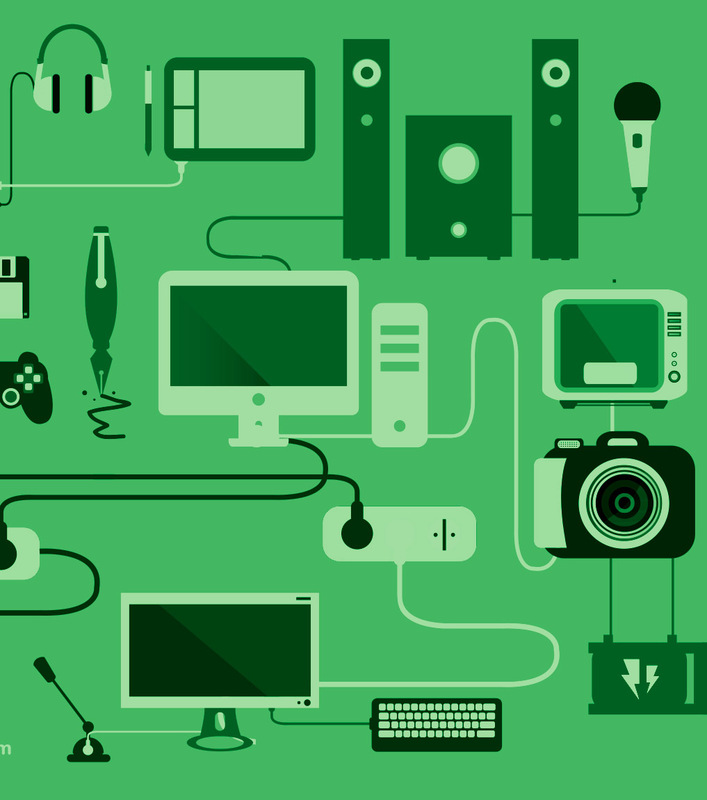 This guide is intended to help you learn and become comfortable with Microsoft Excel. It is based on using Excel 2010 or 2013 on a Windows computer, but the concepts and tools covered are general and remain consistent with more recent versions of Excel for Mac or Windows. Use the tabs above to browse the guide and be sure to check out the sources of extra help to the right. 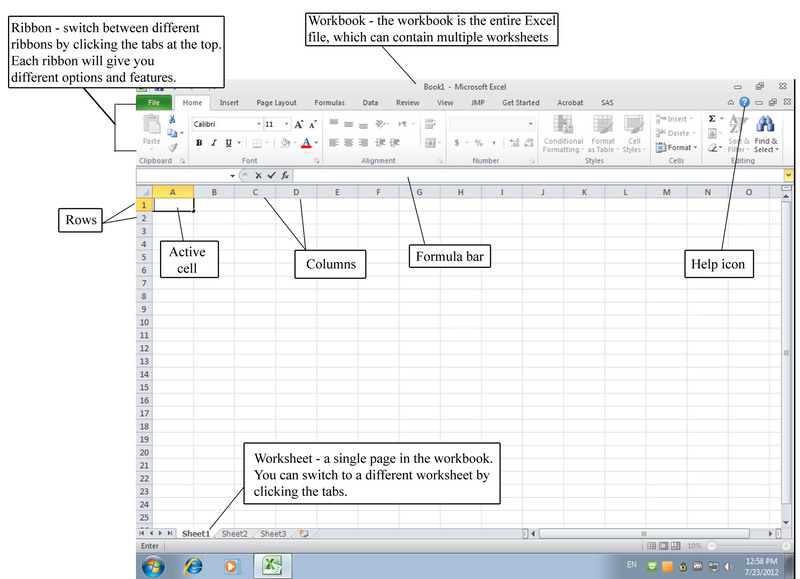 If you are completely new to Excel and need a quick overview of its basic tools, please click here to see this screenshot. For help with printing and page break view, see the video below. 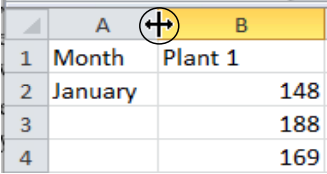 After you copy data, right-click in the cell you would like to paste into. If you hover over one of the Paste Option icons, you will see a preview of what the data will look like. Are you pasting a formula? Do you want just the value of the cell? To keep the same formatting?Once you choose, click the appropriate button to paste the data. In addition to the more common shortcuts such as copy, cut, paste, and save, Excel has a number of shortcuts that you will find helpful - some you may know, others maybe not! The Esc key or red X in the Formula bar will abort your change. From the Home Ribbon, you can format the font, number, alignment, border, pattern, and protection of your cells, rows, and columns. You can also click on the Expand icon to open the traditional Format Cells dialog box that contains tabs for these various categories. Just as the Home Ribbon provides you with the options that used to be only accessible in the Format Cells dialog box, the Page Layout Ribbon gives you access to features that used to be in the Page Setup dialog box (click on the Expand icon to access that traditional dialog box). In the Page Setup Group, you canset the margins, orientation, and print area. Note that the Print Titles icon evokes the Page Setup dialog box, and that in this instance Print Titles refers to the row and column headings (e. g., A, B, C, 1, 2, 3, etc.) not the sheet‟s headers and footers. With the Page Setup dialog box open, you can click on the Header/Footer tab to change them. You can also access the headers and footers on the Insert Ribbon. You can change a column's width by putting your cursor between the letter for that column and the next. When you get the two-headed arrow, drag to the right or left as desired. Double-clicking on that same spot will “autofit” the column, making the column as wide as the largest piece of text/data in that column. The same technique works for rows; put your cursor between the two numbers until you see the two-headed arrow, and then drag or doubleclick. To hide a column or row, right-click on the letter or number for the column or row (A, B, C, etc. or 1, 2, 3, etc.) and select Hide. To unhide a column or row, select the columns or rows before and after the missing column or row, right-click, and select Unhide. To see where your data will split into multiple pages, go to the View Ribbon and click Page Break Preview icon in the Workbook Views Group. Adjust the page breaks by clicking and dragging the blue borders with your mouse. To return to the normal view, click on the Normal icon. Watch the video for a demonstration of the steps described above.